On Monday, over half-a-dozen Arab and Muslim states led by Saudi Arabia cut off relations with Qatar, ostensibly over the latter's support for terrorism and interference in other countries' internal affairs. Speaking to Sputnik, George Washington University professor Atef Abdel Jawad commented on the US position in this diplomatic crisis. In the early hours of Monday morning, Saudi Arabia, the UAE, Bahrain and Egypt announced that they had severed diplomatic relations with Qatar. 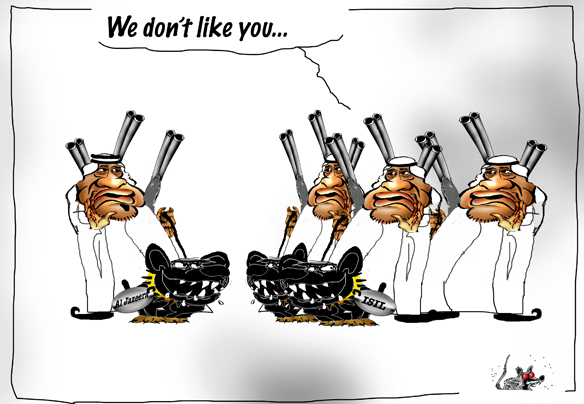 Hours later, Libya, Yemen and the Maldives announced that they too had cut ties. Riyadh kicked Qatar out of its coalition in Yemen; Yemen alleged that Qatar was providing support for the Shiite Houthi rebels. Collectively, the countries accused Qatar of supporting terror groups such as the Muslim Brotherhood, and of engaging in efforts to destabilize countries in the region. Doha protested, calling the countries' decision "unjustified," and "based on assertions without foundation." Amid the crisis, US Secretary of State Rex Tillerson urged the Gulf Cooperation Council and Qatar to resolve their differences and stay united. "We certainly would encourage the parties to sit down together and address these differences, and we – if there's any role that we can play in terms of helping them address those, we think it is important that the GCC remain unified," Tillerson said. The US's close partnership with Saudi Arabia, strengthened recently following President Donald Trump's visit to the region, is nuanced by the fact that America's largest military base in the region – the Al Udeid Air Base, is based in Qatar. Speaking to Sputnik about the diplomatic crisis, George Washington University professor Atef Abdel Jawad explained that the US position can be expected to have at least two elements. "First, the US always says that bilateral crises between any countries concern, above all, those two countries themselves, and that the US does not interfere in bilateral relations. In the situation regarding Qatar, this is [said to be] an internal issue involving Bahrain, Saudi Arabia, Egypt and the UAE." At the same time, however, the academic added that it can certainly be said that "the US is dissatisfied with Qatari links to terrorist organizations and their financing." According to the observer, Qatar's position runs contrary to President Trump's efforts against terrorism and extremism. For instance, Qatari state media invites commentators who call for Christians to be killed. The emirate is home to people who have provided financing for al-Qaeda. "We know how the US feels about those who support and finance al-Qaeda," Jawad said. The observer recalled that as far back as 2015, then-Secretary of State John Kerry complained about Qatari financing for terrorist groups. Its from these kinds of statements that the nuances of US policy can be determined, according to Jawad. "Right now in America, there are voices proposing adding Qatar to the list of state sponsors of terrorism. But it has not happened for several reasons. First of all, Qatar hosts Al Udeid Air Base. Washington is interested in maintaining this base, which is a critical strategic point for the US in the region." "Secondly, Qatar is needed for its secret ties with the terrorist groups. The US, the countries of Western Europe and other leading powers officially declare that they do not conduct any negotiations with the militants and have no ties with them. This role is played by Qatar." Finally, Jawad recalled, "Qatar is helping with the release of European hostages who have been abducted by terrorists." However, Babak Mohammadzadeh, a PhD researcher at the University of Cambridge's Department of Politics and International Studies, suggests the en-masse ostracism of Qatar has much more to do with long-held concerns among the GCC over Qatar's "independent" approach to foreign policy. "Qatar has always pursued a more independent line, cultivating ties across the region and involving itself in places such as Lebanon and Yemen. The way the country relates to Iran has also produced rampant concerns in Riyadh — Saudi Arabia and others are keen to control Qatar in this regard. The traditional GCC line on Iran has been that there needs to be strong opposition to Iran's aggressive pursuits across the region, but Qatar has so far been unwilling to submit to that. This is all aimed at bringing Qatar to heel," Mr. Mohammadzadeh told Sputnik. Let's be clear: Full blockade of Qatar is a declaration of war according to international law. A first step towards larger war against Iran? ​Moreover, he believes Riyadh's use of the term "terrorism" and related phraseology is deliberately designed to cloud its real motives — namely, its specific geopolitical aims in the region, particularly those relating to Iran. As such, whenever Saudi spokespeople talk of terrorism it's important to be "critical and cautious" — and he warns against employing the terminology advocated and espoused by the Kingdom. Trump says he will do what is necessary following the #LondonAttacks. Amazing! Does this include ending arms sales to Saudi Arabia? ​Saudi Arabia is a close ally of the US — a toxic marriage reaffirmed by a May visit to the Kingdom by President Donald Trump, which inaugurated the largest single arms sales deal in United States history — raising questions about whether the US will support or oppose the regional move. Nonetheless, as Qatar is likewise a close US ally in the region, it's questionable whether American support for the Saudi-led actions will be reflexive. WASHINGTON (Sputnik) — The e-mail published late on Monday was dated by August 2014 and was addressed to John Podesta, then-counselor to President Barack Obama. The message was dedicated to the fight with Daesh terror group (outlawed in Russia) and the military conflicts in Syria and Iraq. The information mentioned in the e-mail was based on sources including "Western intelligence, US intelligence and sources in the region." "We need to use our diplomatic and more traditional intelligence assets to bring pressure on the governments of Qatar and Saudi Arabia, which are providing clandestine financial and logistic support to ISIL [Daesh] and other radical Sunni groups in the region," the letter read. The document also mentioned the ongoing competition between Doha and Riyadh "to dominate the Sunni world." On Monday, Saudi Arabia, Bahrain, the United Arab Emirates and Egypt announced a break in diplomatic relations with Qatar, accusing Doha of destabilizing the situation in the Middle East and supporting terrorist organizations, including the Muslim Brotherhood terror group (outlawed in Russia). The authorities of eastern Libya, Yemen, as well as the Maldives subsequently also announced the severance of relations with Qatar. The Qatari Foreign Ministry, in turn, rejected the accusations of Doha's interference in other countries' domestic affairs and expressed regret over the decision of the Gulf States to cut off the diplomatic ties with it. The military conflict in Syria has been ongoing since 2011 with government fighting against various opposition and militants groups, including Daesh. The influence of Daesh in Iraq has significantly increased in 2014 when the terrorists captured the country's major city of Mosul after invading from Syria. The operation to liberate the city is currently carried out by the Iraqi and US-led coalition forces. The LNG revolution made Qatar one of the world's richest nations with an annual per-capita income of $130,000. The country also became the largest exporter of LNG. Qatar’s offshore North Field, which provides all the country’s gas, is shared with Iran. Qatar also hosts US Central Command and bought a $2.7 billion stake in Russia’s oil major Rosneft. “Qatar used to be a kind of Saudi vassal state, but it used the autonomy that its gas wealth created to carve out an independent role for itself,” said Jim Krane, energy research fellow at Rice University’s Baker Institute, in Houston, Texas told Bloomberg. “The rest of the region has been looking for an opportunity to clip Qatar’s wings,” he added. On Monday, Saudi Arabia, Egypt, Bahrain, the United Arab Emirates, Yemen and other countries cut diplomatic ties with Qatar, accusing the country of supporting terrorism. ​At the same time, however, the US is "grateful to the Qataris" for their "enduring commitment to regional security," Central Command Capt. Kathleen Atanasoff told Stars and Stripes on Tuesday. Saudi Arabia’s new land blockade may threaten civilians reliant on food imports, but US military forces at the air base unsurprisingly don’t count on ground transports for many supplies. As such, they aren’t likely to be affected by the rift, Central Command said. Clearly wrong-footed by the president’s Twitter outburst, Dana Smith, US ambassador to Qatar, noted that it was a "good time" to reaffirm that the "US supports #Qatar’s efforts in combatting terrorism financing & appreciates its role in coalition against [Daesh]." With the president making policy and positions on the fly, once again, the representatives of the administration can’t seem to stay on the same page as its head. German Foreign Minister Sigmar Gabriel accused US President Donald Trump of stirring up conflicts in the Middle East and risking a new arms race as Qatar's neighbours cut ties with Doha. Saudi Arabia and allies including Egypt, the United Arab Emirates and Bahrain announced Monday they were severing diplomatic relations and closing air, sea and land links with Qatar. "This policy is completely wrong and is certainly not Germany's policy," he added, in extracts of his interview released Tuesday. "I am very concerned with the dramatic escalation and the consequences for the whole region." Trump on Tuesday backed the regional efforts to isolate Qatar, supporting Saudi Arabia and its allies and suggesting the key US ally - home to the largest American airbase in the Middle East - has been funding extremism. During his recent visit to Saudi Arabia, Trump signed arms contracts worth $110bn with Riyadh. The rupture of diplomatic relations between Saudi Arabia, the United Arab Emirates, Egypt and Bahrain on one hand, and Qatar on the other, marks a radical change in the situation of the Middle-East. No major political-military developments are excluded. American Air Force Squadrons would carry on flying in Doha, while the ruling coalition of Arabic countries announced the interruption of all ties, including air, sea, and financial connections, with the Kingdom of (whimsical) emir Tamim In Hamad Al Thani. The borders are closed and embassy officials are to return to their capitals at once. The Al Jazeera TV channel, Qatar's voice, will be forbidden anywhere else. What has happened is not easy to decipher. The motive of the confrontation at first was a statement by the Qatari Foreign Minister, Mohamad Abdulrahman Al Thani, that was considered offensive to Saudi Arabia and, above all, too friendly to Iran. Mohammad Abdulrahman had twisted a rather harsh comment on the dispute to discredit Qatar-- "particularly strong" against Saudi Arabia and published in the American press -- idiotically quoting the words of Imam Ali, the "grand Imam" of Shiite Muslims : "There is a remedy for every wound, with the exception of the lack of ethics, because there is no remedy for this." The government of Qatar has denied the statement, blaming it as an attack of hackers who were able to penetrate the official website and send a false statement on the net. But the fiery response of the four Arab-Sunni countries ​​did not give up on the pretense, whether true or false. Evidently the reasons for the break are deep. After Trump's trip to Riyadh and his blessing to the new Arab-Sunni coalition against Shiite Iran, Saudi Arabia believes it has now been free to dictate Gulf Laws. Qatar, "too" free from Riyadh, is the first one to be put back in its place. The accusation against Qatar's "support for terrorism" -- as ironic as it is from the country that most funds and organizes the forces of the so-called Islamic State -- tries to hide the evidence of several terrorist organisations sponsored by Riyadh. In fact, Qatar has been, in years of dizzying growth in its financial strength, one of the supporter of its "Salafism" Sunni component, rather than the Saudi Sunni Wahhabi. This refers to the Muslim Brotherhood and some members of the mercenary alliance of Al-Nusra and Al Qaeda, as well as the Hamas party in Palestine. This explains the presence of Egypt's Abdel Fattah Al Sisi in the anti-Qatar coalition and of Riyadh (which, among other things, guarantees oil at advantageous prices). While Bahrain -- which has a strong Shiite presence -- has accused Qatar of "engaging in its domestic affairs and of supporting extremists in Yemen." US Secretary of State Rex Tillerson said he did not believe the decision of Riyadh and members would "have any significant impact" in the region and globally. It is obvious though, that, to the contrary, the effects will be very serious, with repercussions on many levels. The stakes in the game are gigantic and go beyond the controversy of who is "more of a terrorist suppoter", and beyond the centuries that have divided the Sunnis and the Shiites. The gas supply is strongly in the background. It is the main source of Qatar's wealth, which it exports by tankers. But the immense methane field that has been identified at the center of the Persian Gulf -- half in the territorial waters of Iran -- represents decades of supplies and endless cash. It is well-known that one of the reasons for the "Arab-born" constitution by Donald Trump is to ensure that the gas is controlled (by the Saudis). It is not a mystery that one of the causes that created the war against Syria was Bashar al-Assad's decision not to allow the passage of the gas pipeline of Saudi Arabia to reach the Mediterranean. The hope of Riyadh now rests, after the defeat of ISIS in Syria, with a route through Jordan and Israel. But Doha's plans could be to follow the Iran-Turkey-Mediterranean route, that is to say, it needs cooperation with the sworn enemy of Saudi Arabia and Israel, Iran. While Tillerson is not worried, he should be. Mind you, Washington may have already pulled the trigger and decided to sink the emir Tamim of Qatar. The author's opinion may not coincide with the position of the editorial staff. The translation above was not an easy one to achieve clearly (Italian is a language full of what we think are "known words" but have a totally different meaning). The point now is that we know Qatar is being isolated for its "possible" dealings with Iran, in order to sell its gas to Europe, through pipelines rather than ships. Presently the gas supply to Europe race is favouring the Russian gas though the US is tying hard to impede the Russian progress. This is why they are maintaining sanctions -- NOTHING ELSE. This is why the war in Syria is being fought with various factions supported by the US, EVEN IF THESE FACTIONS ARE AL QAEDA (sponsored by the Saudis) and ISIS (indirectly supported by the Saudis). Many innocent people are dying in Syria because of GAS SUPPLY TO EUROPE and the enormous wealth that this represents. The USA will stop at nothing to prevent the Russians to succeed. The US will even betray their "friends" of Qatar. Presently Qatar's fortunes are going up, while that of the Saudis are going south. This was a red flag to the Saudis. We need to mourn the lives lost to this madness, but it won't stop until we really see and deal with the origin of the problems: not ISIS but oil, the USA and Saudi Arabia. The Qatar diplomatic crisis has prompted a heated debate among international observers, with the most confusing part of the unfolding controversy being that its Gulf neighbors, particularly Saudi Arabia, accusing Doha of sponsoring terrorism. Early Monday morning, Bahrain, Saudi Arabia, the United Arab Emirates (UAE), and Egypt cut diplomatic ties with Qatar in a coordinated move. The countries closed land, air and sea passage to all vessels and vehicles coming from or going to Qatar. "The Government of the Kingdom of Saudi Arabia, exercising its sovereign rights guaranteed by the international law, and protecting national security from the dangers of terrorism and extremism, decided to sever diplomatic and consular relations with the State of Qatar," Riyadh's official statement read. Libya's eastern-based government and internationally-recognized Yemeni authorities followed in their regional allies' footsteps. In response, the Ministry of Foreign Affairs of the State of Qatar expressed its "deep regret and surprise" at the decision of its Gulf neighbors. "Qatar is an active member of the Gulf Cooperation Council [GCC] and is fully committed to its charter. Qatar respects the sovereignty of other nations and does not interfere in their internal affairs, and it has fulfilled its role in fighting terrorism and extremism," the statement said as quoted by Al-Jazeera. Reportedly, the trigger behind the coordinated move was Sheikh Tamim Al Thani's remark, quoted by the Qatar News Agency (QNA), that Iran was an "Islamic power that cannot be ignored." Although Qatar rushed to denounce the report as fabricated by "unknown" hackers, the damage was done and Saudi Arabia's Okaz newspaper lambasted Doha for siding "with the enemies of the nation." For his part, US President Donald Trump also pointed the finger at Qatar. The Turkish parliament on Wednesday approved draft legislation allowing the deployment of Turkish troops to a military base in Qatar in light of the ongoing rift between Qatar and other Gulf Arab countries, Turkey's NTV television reported. ANKARA (Sputnik) — According to NTV, the deployment of Turkish soldiers in Qatar will be carried out in accordance with the agreement on cooperation between the two countries in the field of security and training of police officers, signed in 2015. Qatar has signed a $12-billion contract to buy F-15 fighter jets from the US, the country’s defense ministry reported. The deal was announced just days after US President Trump accused Doha of supporting terrorism. The contract was apparently sealed after a Wednesday meeting between US Secretary of Defense Jim Mattis and Qatari Minister of State for Defense Affairs Khalid al-Attiyah, Reuters reported citing a source. According to Bloomberg News, Qatar bought 36 warplanes produced by McDonnell Douglas, a subsidiary of Boeing. The US approved the possible sale of up to 72 F-15QA aircraft to Qatar for $21.1 billion in November. Trump’s criticism emerged amid a diplomatic row between Qatar and other Arab nations, which demand that Doha stopped supporting the pan-Arabic movement Muslim Brotherhood and severed ties with Iran. Qatar is a key American ally in the Middle East and an important exporter of natural gas. It also hosts the largest US military base in the region. Charlie Wilson’s war was shown on SBS the other night. It’s a movie about how a womaniser Democrat got the USA strongly involved in pushing back the Russians in Afghanistan by supporting the Mujahedeen in the 1980s. The movie is quite cartoonish in its depiction of the characters despite being played by major actors from Tom Hanks to Julia Roberts. I suppose and I hope that this was the aim of the movie to show the US placing its holier-than-thou mittens on something they would eventually muck up, by not understanding the ramifications thereof of who they were dealing with, “possibly with good intentions” — as long as communism was fought and pushed back. This US sponsored covert war soon led the Mujahedeen to morph into the Taliban who took over Afghanistan. The US is still fighting in Afghanistan against the Taliban, which in religious term is like ISIS, and according to some military sources, the USA are planning to send 20,000 troops there to do whatever more crap US troops end up doing. At this stage, the game is still crap. The Russians only got in the war in Afghanistan to protect a burgeoning socialist regime which was fighting religious intolerance and favoured gender equality contrary to the teachings of the Q’ran. If one knows what’s really going on in Afghanistan, one would revisit square one of the game. It’s still a religious hotbed with many conflicting entities including opium suppliers. The future is unknown. Until a charismatic figure can unite most of this country, things will go from bad to bad, with some windows of opportunity soon turning into windows of corrupt opportunism. The one thing one can say is that Russians have been shy to get involve in such conflicts, except Syria where their own interests have been under threat. At this level, the new technology has helped defeat rebels even if these are equipped with anti-tank launchers. Satellite navigation has given the rise to smart bombs that can hit with an uncanny precision a small tin-can on the ground, while being launched from 40,000 feet, where the rebel anti-aircraft rocket can’t reach. ISIS is slowly being defeated in Syria and Iraq, but their sponsors, Qatar and Saudi Arabia are still the recipient of US largess despite having had a barney as to who is the biggest badass supporter of terror on the planet — while the real reason is about the supply of gas to Europe. Qatar has dismissed a list of demands submitted by four Arab nations as neither reasonable or actionable. "This list of demands confirms what Qatar has said from the beginning – the illegal blockade has nothing to do with combatting terrorism, it is about limiting Qatar's sovereignty, and outsourcing our foreign policy," said Sheikh Saif bin Ahmed Al Thani, director of the Qatari government's communications office, in a statement on Friday. "The US Secretary of State recently called upon the blockading nations to produce a list of grievances that was 'reasonable and actionable'. The British Foreign Secretary asked that the demands be 'measured and realistic.' This list does not satisfy that criteria," added the statement. Qatar says it is reviewing the demands and is preparing an official response after confirming the receipt of a document containing demands from several Arab countries that cut ties with it and imposed a blockade against it earlier this month amid a major diplomatic crisis. The list was received by Qatar's ministry of foreign affairs on June 22, the state-run Qatar News Agency reported early on Saturday. The bombastic allegations reeked of grandstanding and hypocrisy. So when the Saudi-led camp imposed a stringent list of 13 demands and a deadline of June 23 for compliance, the Qataris simply ignored the ultimatum. One of those demands was for Qatar to shutter the Al Jazeera channel. That was as outrageous as it was preposterous. Al Jazeera is a respected news service with an international recognition, unlike any of the media based in its Arab rivals. To call for its closure betrayed the despotic nature of Saudi Arabia and the others. The standoff in the Gulf was acutely discomfiting for Washington. Its association with despotic regimes was coming under sharper focus than ever. But not only that. The Americans rely on Qatari territory for its main military base serving the entire Middle East. It is where the American Central Command is headquartered. The airbase at al Udeid, where 10,000 troops are stationed, is the hub for US air strikes in Iraq and Syria, and the coordinating center for wider operations, from Afghanistan to Yemen. For the Gulf row to spiral into a crisis – as it was threatening to do given the intransigence on both sides – was viewed with deepening apprehension in Washington. America’s strategic position in the energy-rich region is predicated on unity between the Sunni kingdoms. At stake is US military projection, the global petrodollar monetary system and excluding Iran from capitalizing on any political schisms. US President Donald Trump blundered into region when he initially backed the Saudi-led bloc in its dubious claims against Qatar. Trump singled out Qatar as a “sponsor of terrorism” and appeared to take credit for green lighting its isolation during his official visit to Saudi Arabia on May 20-22. It appears that Trump went rogue on his own State Department. Because ever since the Gulf erupted, Secretary of State Rex Tillerson has been at pains to defuse the crisis. Last week, Tillerson was engaged in shuttle diplomacy, flying between Qatar and Saudi Arabia to get the two sides to bury the hatchet. His efforts were in vain, as Qatar refused to bend the knee for its neighbors. Within days of Tillerson returning to Washington having failed to resolve the Gulf dispute, the US media started cranking out a series of damaging stories on the Saudi rulers and their Gulf allies. Among of the stories this week receiving prominent American news coverage was the arrest of a young Saudi woman wearing a miniskirt. She was seen in a video strolling through a remote Saudi village donning a short skirt and a cropped top bearing her mid-riff. The video went viral on social media, and the hapless young female was subsequently arrested by the Saudi religious police in the hyper-conservative kingdom, where women are forbidden to show flesh. All the US media majors went big on the story. The young lady was promptly released from custody without charge. Then there was the story of a Saudi university student facing execution by beheading because he allegedly participated in anti-government protests. Mujtaba’a Al Sweikat was due to go to Western Michigan University in the US, but he has spent the last five years in a Saudi jail. Newsweek reported this week that President Trump is being implored by the American Federation of Teachers to intervene in order to spare the student from a grisly death penalty. Another juicy read was about palace intrigues in the House of Saud, as reported by the New York Times. From that account, it appears that the Saudi Crown Prince, Mohammed bin Salman, ousted the previous incumbent in a soft coup last month. It also appears that the sidelined prince, Mohammed bin Nayef, has been placed under house arrest to prevent a counter-coup. Evidently, from the oblique references to sources, the NY Times relied on the CIA for much of its claims, whose net effect is to undermine the Saudi authorities. But the big story this week to hit the Saudis was the claim from US intelligence agencies about the hacking of fake news in the Gulf. The story was given prominence by the Washington Post and in a follow-up by the NBC outlet. American intelligence came out to effectively back Qatar’s side in the row with the other Gulf states. The US assessed that the official Qatar News Agency website was hacked by “the government of United Arab Emirates” on May 24, which sparked the whole stand-off in the first place. Awdah and Qarni, who have millions of followers on social media, were among Saudi scholars who opposed the presence of US troops in the kingdom during the 1991 Gulf War over Kuwait. They have both been accused of links to the Muslim Brotherhood, which Saudi Arabia has blacklisted as a "terror group". The detentions follow widespread speculation, denied by officials, that King Salman bin Abdulaziz Al Saud intends to abdicate to his son, Crown Prince Mohammed, who dominates economic, diplomatic and domestic policy. The Saudi authorities have not commented on the latest arrests of activists. But at the start of the week, the attorney general warned that any attack on "national unity" or the "image of the state" amounted to a "terrorist crime". A top official from UAE, one of the four countries to boycott Qatar since June, has claimed that Doha neither wants to host the 2022 World Cup, nor is capable of doing so, adding more pressure on the Gulf state in the wake of a damaging report published last week.“If the World Cup leaves Qatar, Qatar’s crisis will be over,” the head of security for the Emirate of Dubai, Dhahi Khalfan, tweeted on Sunday night. On Monday, Khalfan took to social media again to clarify his“personal analysis,” and implied that Doha itself has provoked the standoff. If this report is correct, it confirms that the Saudis and Emiratis are even more reckless than we already knew them to be. They are an even greater menace to regional stability and peace than they appeared to be. It is also another reminder that Trump’s embrace of Mohammed bin Salman and his father over the last year and a half is dangerous and irresponsible, and it has encouraged them in their destructive and destabilizing behavior. Tillerson deserves credit for preventing a costly and unnecessary military intervention that would have further destabilized the region and cost lives. It is unfortunately not surprising that the one thing that he managed to get right during his tenure as Secretary of State contributed to his eventual downfall. It is a sign of the corrosive influence that the Saudis and Emiratis have on U.S. foreign policy that their hostility to Tillerson was probably one of the main causes for his removal. The story shows that the U.S. can successfully rein in its reckless clients when it wants to. If the Trump administration wanted to use its influence to halt the disastrous, atrocious Saudi coalition war on Yemen, they could do so. It might be more difficult than preventing an attack on Qatar, but it could still be done. The Trump administration doesn’t rein in the Saudi coalition in Yemen because it has no wish to do so. It supports the Hodeidah offensive because it is indifferent to the fate of millions of Yemenis that might die of starvation as a result. The administration enables deliberate Saudi attacks on civilian targets in Yemen because it values catering to despotic regimes more than it does adhering to international law and respecting human rights. Millions of poor, starving Yemenis lack the clout and connections that Qatar’s government has, and they have no one to speak for them, so they are subjected to the worst possible treatment with Washington’s approval while Qatar is shielded from Saudi invasion.